In the bowels of the Ropersville Museum of Science, Nature and Antiquities, Diane Carter sighed and leaned back in her desk chair. She had been trying to find information on a new acquisition for the past week, but it was no use. All the tests indicated that the item was genuine, but she could find no evidence that it ever had existed! With a frustrated groan, she jumped from her chair, grabbed her sweater and headed for the nearest exit. There had to be an answer; maybe some fresh air wouldhelp her think of it! The Museum was at the edge of Ropersville University, so Diane strolled the campus. More than a few of the male students slowed down to watch the attractive woman go by. Diane was slender, but her short skirt showed off her long legs marvelously. Her roundish face was freckled and her brown hair was pulled back into a short ponytail that nestled between her shoulders. She moved quickly and breathed deeply, letting the motion and fresh air revitalize her. "Diane, hi!" a voice called out. Diane turned to see one of the co-eds jogging towards her, carrying her books in one hand and a portable "boom box" radio in the other. She quickly recognized the girl as someone who occasionally took her aerobics class. "Hello, Liz," she replied. Before the girl could reply, the music on the radio was replaced by an ear-splitting shriek. Both women grabbed their ears, but the noise seemed to slice right into their brains. Slowly, they sank to the ground unconscious. When Diane woke up, she was in a hospital bed in the campus infirmary. The bed was in the hall; in fact, the hall was filled with beds, wheelchairs and people lying on the floor, all seeming to be in various states of consciousness. A nurse noticed that Diane was awake and called the doctor. As the doctor examined Diane’s eyes with a penlight, listened to her heart, and checked her pulse, she asked what had happened. "Some crazy named Dr. Toxin used radio waves on selected stations to place people in a sort of mild coma," he explained. "If the city doesn’t pay him one million dollars, he threatens to override ALL TV and radio stations and put everyone to sleep. Well, you seem to have no after-effects. If you feel up to it, you’re free to go." Diane left quickly. She felt fine, and was sure that the hospital needed the bed. Besides, she had other things to do… In a secluded alley behind the student union building, Diane placed her left hand over her heart and touched her right hand to her belt buckle. Then she took a deep breath and said, "I invoke the Golden Goddess!" Gold light spread out from Diane’s buckle to engulf her body. Under that light, her body seemed to flow and change. In seconds, the glow faded, and Diane’s slender brunette form had been replaced by the voluptuous, blonde-tressed Golden Goddess! She wore a golden miniskirt, vest, boots and gloves, all trimmed in light brown. Her belt buckle and headband both bore the five-pointed flower/star that was the symbol of her powers. Her bright blue eyes flashed in joy as she raised her right hand. "Chariot of Air," she called. A billowy cloud appeared before the heroine, who stepped forward and sat on it. The cloud miraculously supported her weight, and then, at a mental command, lifted Golden Goddess skyward. "I have to stop this Dr. Toxin," she said. "And I may as well start at the local radio station!" After the quick trip through the air, Golden Goddess found the radio station in a state of disarray, which she expected. However, she didn’t have time to deal with the chaos, so she simply walked past the harried receptionist and climbed the stairs to the executive offices. Then she sought out the office of the station manager. The woman in the office had long hair that was a strange red color, almost magenta. She wore her hair pulled back into a bun. When Golden Goddess entered the office, the woman introduced herself as Ms. Fisher, the acting manager. "The regular station manager was caught off guard by those bizarre sonic waves," she explained. "I was in the supply closet at the time, so I was spared… and left to deal with this mess! But, I’m sure you don’t want to hear my problems. How can I help you?" Golden Goddess got right to the point. "For Dr. Toxin to carry out his threat, he’d need a powerful broadcasting unit to override all those signals. Since you have a broadcast station, and since your station was one of the ‘test cases’ he used, I’m assuming that he might be planning on somehow tapping into YOUR signal to effect his plans." Ms. Fisher wrinkled her brow. "That makes a certain amount of sense, but I don’t see how it would be possible…"
"This person is obviously very intelligent," the golden-haired heroine said. "I wonder if we could inspect your broadcasting equipment, to see if any changes might have been made without your knowledge?" "Of course," Ms. Fisher said. "In fact, I’ll take you there myself." As she got up from behind the desk, the redhead pulled a small pistol from her purse and fired it at Golden Goddess! The blonde’s body stiffened as the tiny dart entered her skin. She tried to speak, but found her lips, tongue and vocal cords as paralyzed as the rest of her body. As her vision began to blur and her legs slowly crumpled beneath her, the heroine noticed Ms. Fisher frantically dialing the phone. Golden Goddess slumped to the floor and, just before she passed out, she heard the station manager speaking into the receiver. "Daddy? We have a problem…"
As consciousness slowly returned, Golden Goddess was aware of a roaring in her ears. Other sensations began to trickle into her mind: the taste of something dry in her mouth, the feel of something confining her wrists behind her back. The drug wore off more, and the voluptuous heroine became a bit more aware of her environment. She was laying on the floor of what seemed to be a small garage. Her arms were bound tightly behind her, her right wrist tied to her left elbow, and vice versa. Her legs were folded up, so that her ankles were tied to her thighs. Something had been forced into her mouth, and a wide strip of cloth had been wrapped around her head and tied over her lips, holding the object in place. She tested the gag’s effectiveness, and found that it was QUITE good at keeping her silent! There were two cars in the garage, and Golden Goddess quickly realized that roaring sound that she heard, and that she had originally thought to be an aftereffect of the drug that had been on the dart, was the noise from one of the engine’s running. The driver side door of the car was open, and a woman got out and shut the door, testing the handle to make sure it was locked. The woman turned, and Golden Goddess recognized her as a changed Ms. Fisher…and what a change it was! Her long hair was now loose, hanging in a long "tail" to her waist. Her sensible pale green business suit was gone, replaced by a sleek PVC body-suit that looked black, but changed to a dark purple when the light hit it at a certain angle. She was humming a tune softly to herself as she pulled out a set of keys and started walking over to the other car, a red sports car. The woman suddenly noticed that her captive was awake, smiled evilly, and walked over to the helpless heroine. "Good morning, Golden Goddess! I’m SO happy that you woke up before I left; I wanted a chance to introduce myself!" She knelt down next to Golden Goddess and tested the ropes and gag as she continued speaking. "My name is Toxeemia. You may have heard of my father…Dr. Toxin? Daddy is a WONDER when it comes to poison. In fact, he’s carried the whole concept of poison well past the convention notion of the word. One of his recent experiments led to the creation of his new ‘sonic poison.’ Using that, he will be able to get the money he needs to continue his experiments. Too bad you had to get in the way!" "Hmmmmph! Hmmm ummmmph!" Golden Goddess said. Toxeemia sighed as she glanced over her shoulder at the running car. "What’s REALLY too bad is that I have to resort to something as common as carbon monoxide to get rid of you! But, I really wasn’t prepared for this, and the fumes will fill up the executive garage rather quickly, once I leave and shut the door. If it’s any consolation, I hear that there’s no pain involved in carbon monoxide poisoning; you just drift off to sleep and don’t drift back! Well, daddy awaits… ta ta!" With that, the magenta-haired minx hopped into the second car and started up the engine. Golden Goddess watched through the window as Toxeemia laughed while gunning the engine. Then she threw the car into gear and roared out of the exit, pausing only to make sure that the automatic door closed behind her. Minutes later, the lights clicked off, leaving the maiden of myth to struggle, in the dim semi-darkness of the emergency lights, against the tight bonds and the cruel gag. Her options were limited, and she knew it. As the Golden Goddess, her strength and speed were as great as humanly possible. Unfortunately, the ropes were enough to reduce her strength to struggles of impotent fury. Her best, no, her ONLY, hope for escape lie in her command of the Five Sacred Weapons of The Elements. The Sword of Fire would free her in seconds…but , to summon the sword, or any of the weapons, she had to be able to speak! She wasn’t sure if Toxeemia had known that fact, or had simply wanted to prevent her captive for calling for help. In any case, the result was the same: the heavy scarf tied over her lips rendered her helpless. Golden Goddess whipped her head around, flipping her hair back over her shoulder and out of her eyes. As the air already began to smell stale and heavy, she scanned the dimly-lit room, looking for something she could use to effect her escape. The garage was empty, however. The only things in the enclosure were her own tightly-trussed form and the car that was slowly causing her doom. The car! The beautiful, two-ton hunk of metal, covered with corners and angles! There had to be an edge she could use to remove her gag. It WAS going to be risky, however. Closer to the car, the concentration of gas would be heavier, making breathing more difficult. If she couldn’t get the gag off quickly, she had a greater chance of suffocating. Still, there was no other option. With a grunt, Golden Goddess began to wiggle her way towards the car. To say that the going was slow and difficult would be a massive understatement. Because of the awkward way in which her arms and legs had been tied, the voluptuous blonde couldn’t roll over or straighten her legs. She was forced to bend at the waist, supporting her weight on her head and shoulders at the top, and her knees on the bottom. Then she would allow her upper body to slide forward, fighting to keep her knees planted so she wouldn’t lose her progress. In this way, she literally inched her way toward the car. As the air grew thicker, Golden Goddess had to pause more frequently to catch her breath and calm her fits of coughing. The seconds stretched into minutes, and the minutes seemed to stretch into eternity. How long had she been struggling in the darkened garage? It seemed like hours. She couldn’t understand how the car had managed to keep going; surely it should have run out of gas by now? Finally, exhausted, coughing and covered in sweat, the divine dare-doll found herself laying under the rear bumper of the car, her face directly beneath the exhaust pipe with its deadly fumes. Now came the hard part! The Golden Goddess did her best to restrain her coughing fit, and breathed as deeply as she dared in the toxic air. She fought the urge to rest; she knew that if she closed her eyes now, she would never open them again. She stretched her neck upwards, and rubbed the side of her face against the tail pipe. It was hot and burned her flesh, and she struggled to keep from screaming into her gag and wasting the valuable air in her lungs. Instead, she continued to rub until the gag was pushed down below her lower lip. Her dry tongue forced out a lump of material as she collapsed back to the floor. "Sword of Fire," she said in a voice that was barely more than a whisper. The mystic blade of flame appeared in her right hand, and Golden Goddess used the fiery weapon to slash her bonds. Her movements were slow and uncoordinated, and she was glad that the magic fire of the sword would not burn the one who held it. In seconds, the ropes parted and Golden Goddess was free. Rolling over and staggering away from the car, the heroine weakly raised her right arm. "Gateway of the Void," she said in a voice so soft that it almost seemed as if she had just barely moved her lips. But it was enough; the dark circle of the gateway appeared before her. She took a step forward, and collapsed into it, allowing it to swallow her up. Since she hadn’t opened a "destination" gateway, Golden Goddess merely floated in the void. In addition to allowing her to travel from place to place instantly, the void also cured her minor wounds almost instantly. After a few moments, the heroine regained consciousness and reopened the gateway to appear on earth in the office recently vacated by the supposed "Ms. Fisher." She quickly began to go through the woman’s papers. When that didn’t turn up anything, the beautiful blonde scooped up the trash bin and dumped it out on the table. A quick glance through the trash revealed something that may be useful: a map of the city, with several areas indicated by a small x. "Hmmm, let’s see," Golden Goddess muttered as she studied the marked areas. "This one is the radio station. Here’s the airport. I think this is the local public access TV channel… this must indicate the broadcast towers Dr. Toxin is going to use to carry his ‘sonic poison!’ They form a loose ring; so what’s in the center of that circle? The old warehouse district…" She snapped her fingers. "The area where the old tuna factory is! The one that was closed when mercury poisoning in a batch of fish caused the company to bankrupt two years ago! Tuna…Fisher…and the French word for fish is poisson! And, as I recall, the factory had a small transmitter to communicate with their fishing boats. It can’t be just a coincidence. I’m off to the tuna factory!" Outside the tuna factory, Golden Goddess had an idea. She said, "I discharge the Golden Goddess," and reverted back to the form of Diane Carter. "If they think Golden Goddess is dead, I’ll let them go on thinking that until I’m ready to spring my trap!" He wedged her slender body through the gate and walked quietly towards the building. Diane’s pumps clattering lightly on the pavement was the only sound inside the fenced enclosure. The sounds from the road were lost on the breeze. In moments, Diane had the eerie feeling that, by stepping through that fence, she had entered a different world. There was something about the area that disturbed her, something she couldn’t quite put her finger on. Then it hit her: the smell! There was an acrid chemical smell coming from the factory! The pretty brunette’s face lit up with grin. "Closed for two years and there’s a smell? If I needed any proof, I think I just got it…"
Diane picked up the pace as she circled the building, looking for a way inside. In her excitement, however, she allowed herself to get a bit careless. She wasn’t even aware that anything was wrong until she heard a noise behind her, a noise like someone clearing their throat. She whirled around and found herself face-to-face with a man who could only be Dr. Toxin. The man was short and somewhat homely, with rough features that almost looked like they had been formed by a child out of clay. He wore thick glasses, and had no hair on the top of his head, just long strands of gray hair on the sides and back of his scalp. 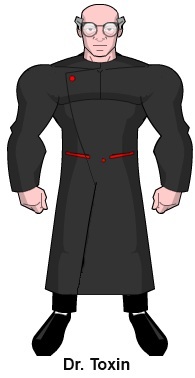 Despite being only five-foot-two, Dr. Toxin’s body was thickly muscled and, clad in a dark suit and black lab coat, looked imposing. So did the gun in his meaty fist. "May I help you, my dear?" he asked in a nasally voice. Diane thought of invoking the Golden Goddess, but hated to reveal her secret identity. Besides, she could always change later, if things got bad! First she had to find out the extent of the doctor’s plans, and Toxeemia was still unaccounted for. Better to buy some time for now. "I’m sorry," she said, "I seem to be a bit lost. I didn’t mean to intrude…"
Dr. Toxin shook his head sadly. "IF that’s the truth, my dear, I’m afraid that you are the living definition of being in the wrong place at the wrong time! If you please, step through the door…" He waved the gun to indicated the direction. Diane raised her hands and went where she was told. Inside, the decrepit building actually proved to be in excellent shape. Diane realized that Dr. Toxin must have taken over soon after the factory closed, and spent the past two years fixing the place up. She even wondered if he might have poisoned the tuna to close the place, since it suited his purposes so well! Toxeemia was at one of the large consoles, making some kind of adjustments. She turned when she heard the duo enter the room. "Daddy! Who’s she?" "She claims to be lost. But, no matter what the case, we can’t have her causing us problems now. Be a dear and make her comfortable, will you?" While Dr. Toxin kept her covered with the gun, Diane sat in a wooden chair. She watched helplessly as Toxeemia tied her wrists to the side supports of the chair. Next the magenta-haired witch bound each of Diane’s ankles to the chair legs, forcing her legs apart. She noticed a grin on the scientist’s face, and blushed when she realized that he could now see right up her short skirt. "Look," Diane said, "I just want to get some directions and go home! Why are you doing this? Who are you?" "I suspect that you already know the answer to those questions," the villain said, "but I can play along. My name is Dr. Toxin. I plan to rule the world, and my plans will begin in a matter of hours. It’s a shame that you stumbled upon my operation, because now I’ll have to dispose of you…"
"No, please," Diane said. "I’ll do anything you want, just don’t hurt me!" "I’m afraid that I have no choice, my dear," Dr. Toxin said. "Toxeemia?" Diane decided that she had played her last card; it was time to invoke the Golden Goddess and put an end to this farce. If it meant the end of her secret identity, well, she could deal with that later! But, before she could speak the magic phrase, she found her lips sealed by a strip of duct tape that Toxeemia applied! She was trapped as Diane, in the hands of these fiends! "Toxeemia, would you mind terribly taking our guest down to the vat?" "Oooh, not at all, Daddy!" The villainess grabbed the back of the chair, tipped it back and dragged it away, as Diane fought to free her mouth from the tape. A few minutes later, Diane found herself sitting, chair and all, on a conveyor belt of some sort. Behind her were some of the old machines from the factory, and ahead of her, below the lip at the end of the conveyor belt, was some sort of large vat. The ravishing researcher tugged on her bonds, looking for some bit of slack so that she could remove that blasted gag and transform! Unfortunately, she already knew how effectively Toxeemia could tie, and she was just as just as tightly bound as Diane as she had been as Golden Goddess. "See that vat?" Toxeemia asked from beside a control panel. "Back when the factory was in working order, that was used to catch bones, fish guts, all the unusable parts of the tuna. Today, daddy uses it for kind of the same thing. See, sometimes when he is developing a poison or chemical mixture to have a certain effect, it takes him a few tries. That vat is where he dumps all the ones that don’t work out. The mixture in there now is so toxic that it can kill within seconds of contact! One day, we plan to dump it into the reservoir, but that was when it was full. Now it’s only half-full, but that should be plenty to eliminate you! Now, I’d better go help daddy with the final adjustments. Look at the bright side…at least you won’t be subject to the sonic toxin, now." Toxeemia threw a switch and walked off. With a violent lurch, the conveyor belt started, whipping Diane’s head back and carrying her towards her doom. Diane looked around as she tugged on the bonds and "mmmmphed" helplessly into the tape gag. Unlike her experience in the garage, time was NOT on her side, and her struggles were limited by the chair to which she was bound. Still, there had to be some way out of this trap! Her blue eyes were wide as saucers as she watched the edge of the belt grow ever closer. She looked about frantically for some hope, no matter how slim. As she glanced over her shoulder, Diane saw that she was sitting right near the spot where the two ends of the conveyor belt met. Since the equipment was old, the edges were starting to pull up. It was still connected tightly enough that there was no chance of it coming loose. But the corners were starting to come up, and that was what interested Diane the most. She rocked her body back and forth in the seat until the chair tipped over, dropping Diane on her back. She stretched her face towards the loose corner of the belt, using the rough material to snag the edge of the tape. Slowly, carefully, she pulled her face away, ripping the tape off until it was barely hanging from her face by one corner. "I invoke the Golden Goddess," she said. The transformation was quick, as always, but seemed to take forever to the plucky girl. Golden Goddess looked down her body, and saw that she was practically at the edge of the belt; there was no time to free herself. Thinking quickly, she pointed her bound fingers toward the edge and said, "Gateway of the Void." The gateway appeared at the end of the belt. The moving conveyor carried her into the Void, where she would be able to summon the sword and free herself. Then, Dr. Toxin and his devilish daughter would pay for their crimes! Dr. Toxin sighed as he adjusted his equipment. "No, my darling, but I didn’t really expect one. I’m sure the fools in academia told their political lackeys that what I threatened was QUITE impossible. The fools never did appreciate my genius!" Toxeemia seemed almost pleased at the prospect of unleashing the sonic toxin. "But they will after tonight, won’t they, daddy?" "They’d better. Because once Ropersville is in a coma, the price doubles for us to spare the next city. And we’ll just keep going until either they acknowledge my power, or until everyone in the country is asleep and I can literally walk into power. Fire up the capacitors, Toxeemia." "Bow of Water." The command caused the two villains to whirl around. The saw Golden Goddess standing there in the doorway, like a spirit of vengeance, with a blue bow of energy in her hand. As she drew back the string, an energy arrow appeared. The heroine released the bow, which sped between Dr. Toxin and his daughter, and smashed into their computers. The effect was stunning. The arrow exploded like a water balloon, with cobalt energy "splashing" all over the machine, causing it to short out and explode in a shower of sparks. "NO!!!" Dr. Toxin screamed. "You meddlesome witch! You ruined my plans, but I’ll have my revenge!" He pulled out a large gun, similar to the "Dyno-drencher" water guns available in any toy store. "Taste this contact poison!" "Shield of Earth," Golden Goddess said. The large brown disk, decorated with her five-point flower/star, appeared in her hand and deflected the stream of poison that spewed from the tip of the weapon. "Toxeemia," the fiend yelled, "use your gun and we can catch her in a cross-fire!" He looked over his shoulder and noticed, for the first time, that his daughter was sprawled on the floor, where the explosion had thrown her. He dropped his weapon and ran towards her. "No, Toxeemia!" As the villain cradled his daughter, Golden Goddess walked up behind him. "It’s over, Toxin. But I can keep your daughter safe until she can get some help…"
With that, she summoned a gateway. As the evil Dr. Toxin was projected into the Void, he glared at Golden Goddess. "I swear, you’ll pay for this! Some day, some how, you’ll pay! I will devote my life to destroying you, Golden Goddess!" The blonde heroine sighed as the gateway closed. "Wonderful. Another enemy. And Diane still has to authenticate that new museum piece. Oh, well, one battle at a time!" Moments later, the Chariot of Air carried Golden Goddess towards the police station, where she would release the evil doctor. A smile played around her full lips. Yes, one battle at a time, and this was one that she could chalk up as a victory!